The 2012 Round Pigeon Island Regatta, July 7,2012. This year marked the fifth annual running of this event, and the weather could not have been better. There were three entries for both the Sailing Class and Rowing Class. With three generations represented in the fleet. Elana Anderson skipped her afternoon nap to participate with her daughter Eliza, and grandson Hayden “sailed” with Belle Hutchins. If the Rear Commodore would kindly send the Melvin D. Southworth Three Generation perpetual trophy from the Round the Island race to Elana perhaps she will forgo another nap for the 2013 event. Belle Hutchins and Hayden Childs in "Mad Air, Yo"
Steve Wakelin, Brian Chesney, Madison Wakelin in "The Pickle"
Ally Hermanson, Amy Hermanson, Catherine Elliott in "Sara D"
Liza Childs, Elana Anderson in "Pinata"
Pigeon Island glistened in the abundant sunshine as the combatants for the coveted J.D. Chesney Cup gathered on the float. Rigging their vessels and fine tuning their strategy was the order of the morning. Finally at 1:30 the Race Committee left the dock to set the starting line. The Sailing class was first to start, and at 2:03PM the horn sounded. Tweet, Ketsup, and Mad Air, Yo were “all clear” at the start. 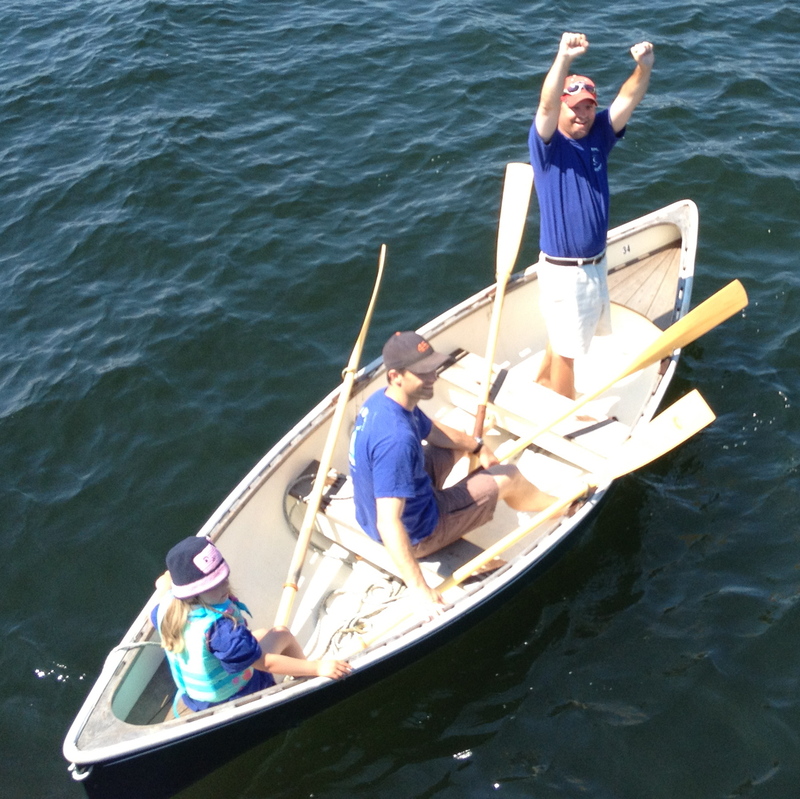 The spectator fleet let out a great cheer, as the three intrepid skippers trimmed for speed. The 5 to 10 knot breeze pushed the fleet down the course on a broad reach. All three skippers elected to leave Pigeon to port. The fleet was bunched when the vanished from view on the far side of Pigeon. Traditionally this has been the point in the race that separates the fleet. There are many unexpected hazards between Mill Island and Pigeon. Meanwhile the Rowing Class starting horn sounded 2:08 PM and in a flurry of grinding oar locks, building bow wakes, grunts and groans they were off. The Pickle built an early lead as they rounded Pigeon Island. The Sailing Class emerged from the dark side of Pigeon, Tweet and Ketchup split tacks. Tweet looking to play the zephyrs in the cove, Ketchup looking for air out side. Little did we know Mad Air, Yo was about to unleash their secret weapon! It was anyones race. The Pickle emerged from behind Pigeon and was charging toward the finish line. The Coxswain keeping the oarsmen rhythm with her battle cry “TICKLE, TICKLE CUT THE PICKLE” echoing off the rocks at Salmon Point. Pinata and Sara D looked to be locked in an epic battle for second place. Tweet and Ketchup both tacked and took aim on the finish line. Ketchup appeared to have a slight advantage The outcome was very much in doubt, when Mad Air, Yo went to the oars. This thing was going to come down to the wire. As Ketchup and Tweet both closed on the finish line Tweet looked to be just low of the Pin end and would have to tack. Ketchup crossed first, followed by Tweet, and Mad Air, Yo third. As The Pickle crossed the finish line, Sara D’s game plan came into focus. rotating rowers keeping the athletes fresh. This strategy was just enough for them to edge out Pinata for second. The J.D. Chesney Memorial Cup was presented on the dock to Ned Gresham by Mar Chesney. Congratulations to Ned and all the competitors for another marvelous event. In addition the Race Committee would like to thank Lucy and Tim Vander Mel for the use of The Rooster for the Committee Boat, and also the spectator fleet for their support of this event. The Round Pigeon Island Regatta Committee has a busy year ahead planing RPIR #6. The 2013 edition will be unveiling the long awaited Rowing Class Trophy. There will be spirited debate as to the potential addition of a third classification. The Hybrid Class, thanks to Mad Air, Yo’s Row/Sail. In addition a committee will also be formed to judge the spectator fleet for the first year of the Spectator Decoration contest. If your plans for 2013 find you on Deer Isle around Independence Day skip the nap, and come out to join in the fun.